For decades, the United States’ food industry has operated through large supply companies that provide the majority of our nation’s foods. This is evident through the thousands of chain supermarkets in operation nationwide. While we are very fortunate to have access to such high volumes and varieties of food, the convenience of such a massive industry cannot exist without some serious consequences. Major grocery corporation’s distribution systems have been linked to food contamination, environmental pollution, morbid obesity, the depletion of natural resources, as well as the minimization of local economies. Because of the ever expanding food industry, we should recognize the negative implications this system can have and contribute to finding solutions. In the past decade, there has been an increase in demand for more sustainable agriculture in the US. As a result, increased measurement and tougher standards for what constitutes as a sustainable crop have begun to take shape. Farmer’s markets are also gaining popularity as a result of this demand and people are realizing the true meaning of words like "fresh" and "sustainable." Proponents argue that locally grown food is fresh, more nutritious, and protects us from many threats of contamination, aside from just plain tasting better. To promote awareness of the value of sustainable foods and the drawbacks of highly processed foods, Denver Botanic Gardens, in partnership with Chipotle, presents the 2012 Chipotle Sustainable Food Film Series. Four films that will bring you to the reality of farming, local diets, and that will walk you through the lives of individuals who are making strides towards a better world. These films are sure to invoke thought about the future of food and inspire you to bring health back to the community. 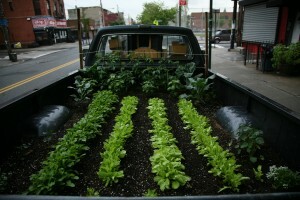 Truck Farm tells the story of a new generation of quirky urban farmers. Viewers are trucked across New York to see the city’s funkiest urban farms, and to find out if America’s largest city can learn to feed itself. Blending serious exposition with serious silliness, Truck Farm entreats viewers to ponder the future of urban farming, and to consider whether sustainability needs a dose of whimsy to be truly sustainable. Visit www.truckfarm.org/see-the-movie/ for additional information on the film. The acclaimed new documentary, American Meat, chronicles America’s grassroots revolution in sustainable meat production. The film explains our current industrial meat system, and shows the feedlots and confinement operations, not through hidden cameras but through the eyes of the farmers who live and work there. The film frames the debate on whether sustainable meat production could ever meet the needs of consumers and showcases farmers who believe they can. Visit www.americanmeatfilm.com/ for additional information on the film. Cafeteria Man is a story of positive movement that shows what's possible in our nation's schools. It’s about the aspiration of social activists and citizens coming together to change the way kids eat at school. It’s about overhauling a dysfunctional nutritional system. It’s the story of what it takes, and who it takes, to make solutions happen. Visit www.cafeteriaman.com/ for additional information on the film. Is a profound, alternative look at the global bee crisis from director Taggart Siegel. Taking us on a journey through the catastrophic disappearance of bees and the mysterious world of the beehive, this engaging and ultimately uplifting film weaves an unusual and dramatic story of the heartfelt struggles of beekeepers, scientists and philosophers from around the world. Together they reveal both the problems and the solutions in renewing a culture in balance with nature. Visit www.queenofthesun.com/ for additional information on the film. All four film screenings are FREE ($10 suggested donation). Please register in advance to reserve your spot! Sample complimentary appetizers from Chipotle before each film and enjoy a panel discussion after the screening. Doors open at 6 p.m., film starts at 6:30 p.m.